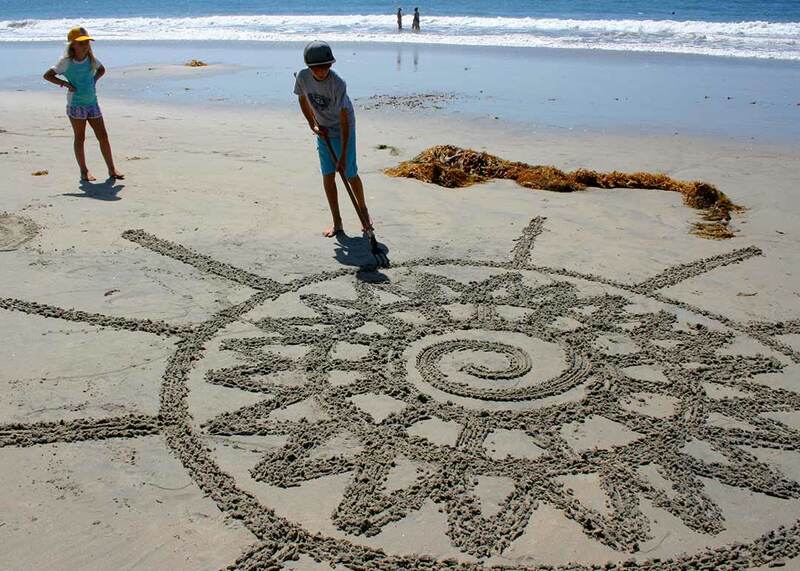 ENCINITAS — Dozens of giant flowers were etched into the sand at Swami’s Beach to create a 350-foot long sand art piece on Sept. 25. The group art experience was led by earthscape artist Andres Amador. 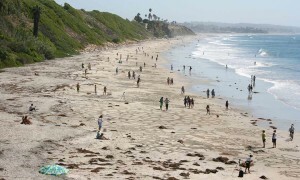 Participants were invited to gather at noon low tide. Amador gave basic how to instructions, and loaned out tools. The idea was to create a field of flowers in honor of a loved one, or in hope of something to come. Directions asked participants to take a moment to think about their intention before they began their design, and again when they were done. Participants, most of who were first timers to the art, used three prong rakes. The finished designs had kaleidoscope symmetry and circular centers for meditation. Amador said Friday’s experience had the potential to be transformative, releasing and fun for participants. People’s descriptions of their experiences were as varied as their flowers. Jeffery Middleton said he heard about the event and made a madala flower in honor of his mother who he lost to cancer three years ago. Amber Hartnell said she happened to run into the event after a walk on the beach. She sat and meditated in the center of a madala flower for the happiness of all beings. Hartnell said she believes we carry a tremendous impact in our wishes towards others. 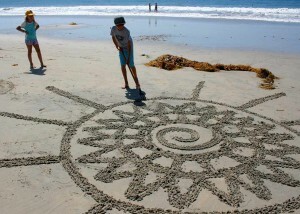 Zach Weaver, 10, of Encinitas, said he creates a lot of art at home, and was making a flower. 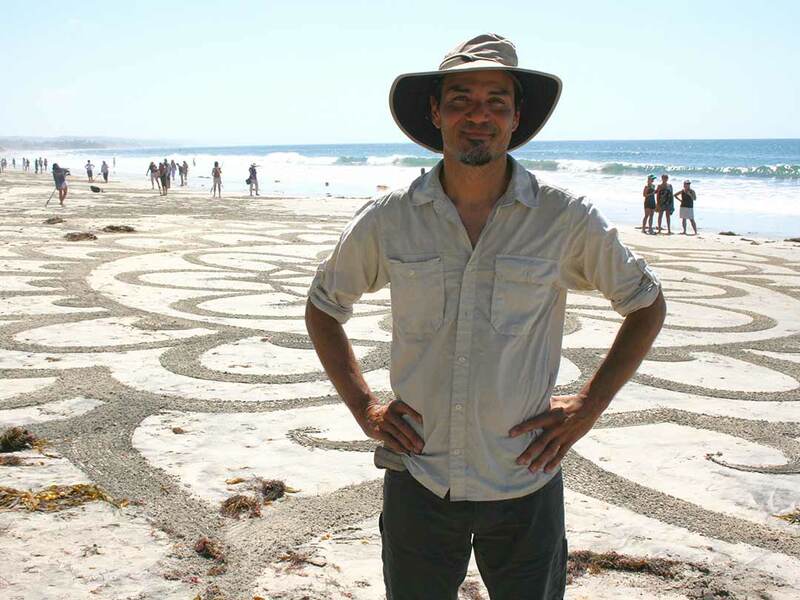 Amador has been an earthscape artist for 15 years, and now works at it professionally. He leads group art experiences, gives workshops and creates commissioned artworks. He said his earthscape art comes from his own exploration. 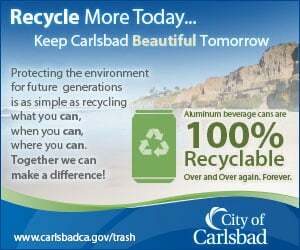 “It’s an entirely organic creation,” Amador said. He uses rope to mark off his design, and while he is a stickler at striving to create a perfect piece, he said it is ultimately more about the process. Amador said his inspiration comes from nature and cultural traditions. He said he is always trying new techniques to allow him to make larger works in less time. 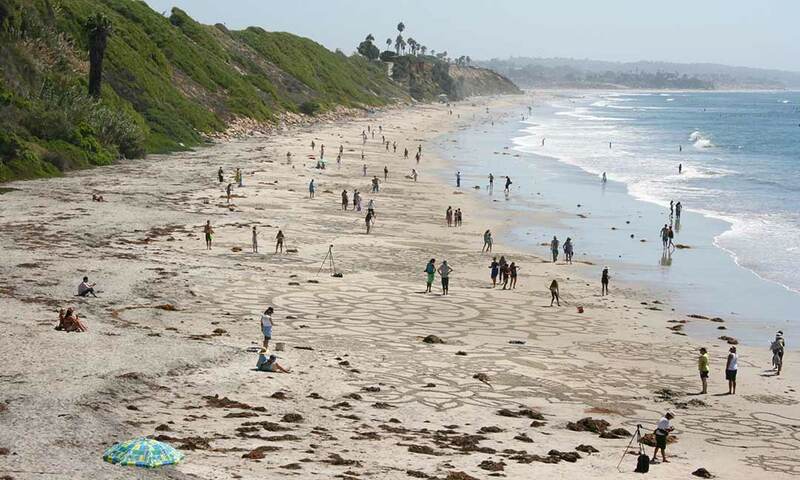 “I have the constraints of low tide,” Amador said. Amador has made hundreds of earthscape art pieces all over the world. He said two of his most dramatic pieces were created in Northern California and Ireland. He added the landscapes for those works were as compelling as the art itself. The free event was organized by Bliss 101 store and gallery. Trish Walsh Haskell, a buyer for Bliss 101, talked about Amador’s work. Photos and a book of Amador’s works are on display, and for purchase, at Bliss 101 in Encinitas. An aerial photo of the day’s artwork will also be on display there soon.